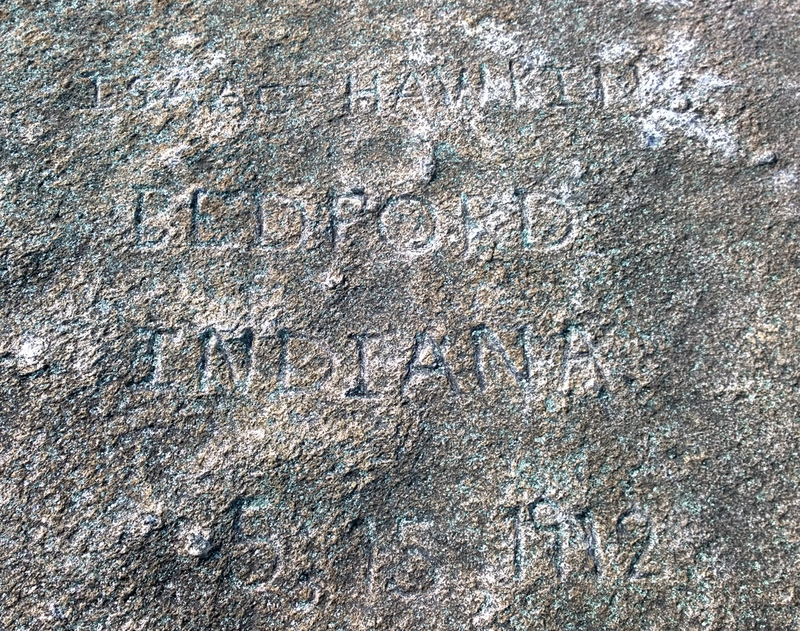 This time, I’m highlighting a couple of individuals who came all the way from Indiana to carve their names on the mountain, Clida A. Reed, and Isaac Hawkins, who list their hometown as Bedford, Indiana. These carvings can be found near the top of the mountain. To find them, veer to the left at the top of the handrails, and take the alternate route to the top, following the white painted line. Approaching the top, start scanning to the right. Clida A. Reed’s carving is further to the right than Isaac Hawkins’ carving, but both are within a few feet of one another. They’re somewhat worn, being more than a century old, but the word “Bedford” is clear in both. They appear to have been carved 15 May 1912, which raises the question of why these men were on the mountain the same day. I couldn’t find any familial connection or shared employer between them, though they were in the same profession. Clida Archester Reed was born in Brown County, Indiana on 24 August 1887, the son of David S. Reed and Polly Reyburn Reed, according to the record of his first marriage to Silva Carpenter on 9 September 1908. On the 1910 census, the closest to the date of the carving he lists his profession as a carpenter in the housing industry. In addition to his wife, Silva, one daughter, Neva, is listed on the census with him. Neva does not appear on the following census in Clida’s household and he has a different wife than in 1910. His name is frequently listed as “Clyde” which gives us an idea how he pronounced it. It’s not known what happened to his wife, Sylva Carpenter Reed, but Clida married Pearlie Elma Manus on 7 December 1912, though she is not listed as his spouse in 1920. On 5 June 1917, at age 29, he registered for the draft, and his card provides a physical description of him, tall, medium build, blue eyes, dark hair and slightly balding. He states he has a wife and two children under twelve and he’s living in Indianapolis. At the time, he was employed by Gaylord Engineering Construction Company, at Fort Benjamin Harrison. Wikipedia states Fort Benjamin Harrison closed in 1991 and is now the site of a state park. By 1920, he’s listed with a new wife, Georgia A., and one son, Cletis, who’s six years old. It’s not known what happened to his wife Pearlie, or whether his wife in 1920 is the mother of his son although she is listed as such on the census. This marriage apparently didn’t last long either, as he’s recorded as marrying Florence E. Stinebuch on 4 August 1923. She’s listed as his wife on all subsequent records. Other than the draft registrations, I couldn’t find any military service records for him at Ancestry, but on the 1930 and 1940 census he’s listed as a World War I veteran. He does appear to have been a civilian employee working for the military at the time of the war. In 1930, the census recorded families who owned radios, and Clida is listed as owning one. He registered for the draft 27 April 1942 at the age of 54. On his registration card, his height is given as 5′ 10″, weight 165 pounds, with a ruddy complexion, dark hair that was going grey and he was balding. His wife is identifed as Florence and he’s working for the Allison Engineering Company. The 1940 census is the last one to be released, and I could find no further records at Ancestry on Clida after 1942, other than a Social Security Death notice which lists that he died in December 1968, and a burial record at Find A Grave which lists only the year of death and states he’s buried at Washington Park East Cemetery in Indianapolis. His son, Cletis Reed, died in San Diego, California in 1973. Clida Reed shows up in only one publicly posted genealogy at Ancestry, as Clyde A. Reed, and his listings on the census from 1900 and 1930 are the only records cited as references. Isaac Joseph Hawkins was born in Monroe County, Indiana on 8 February 1875 according to the Social Security Department. He was the son of Andrew J. Hawkins and Nancy Jane Sowder Hawkins, and appears in Nancy’s household, age 5 on the 1880 census. In 1900, he’s listed as head of his own household, with wife Myrtle and son Arthur. Also in his household is brother-in-law Osker Browning, which gives us Myrtle’s maiden name. Find A Grave lists his date of marriage to Mary Myrtle Browning as 4 July 1897. 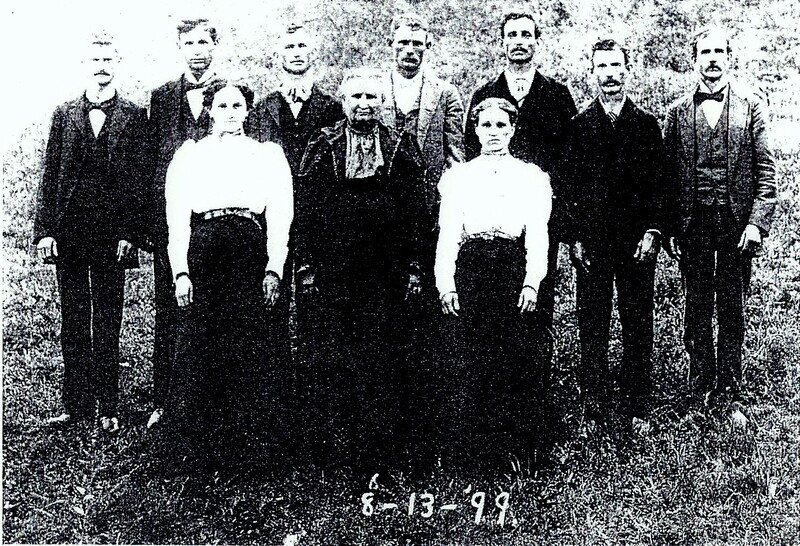 Isaac Joseph Hawkins, far left, from a photo posted to Ancestry entitled, Nancy Jane Sowder Hawkins b 1843 TN and Children 1899 Lawrence or Monroe County IN Dawn Warner Perry 2010 (user gmahug). Used with permission. In 1910, the date closest to the carving, Isaac’s family has grown to include five sons and one daughter. His occupation is listed as a carpenter who builds houses, which is similar to Clida Reed, though there’s no indication they worked together. He registered for the draft on 12 September 1918 at age 43, in Lawrence County, IN. He’s described as medium height and build, with blue eyes and light colored hair. It’s difficult to read who his employer is, plus there’s other writing over top of the employer’s name, which looks like “US Ry Adm.” At any rate, he’s still listed in Bedford, Lawrence County, IN. In 1930, his occupation is listed as “car blocker” in a stone mill. According to Wikipedia, the main industry in Bedford, IN, was quarrying limestone. 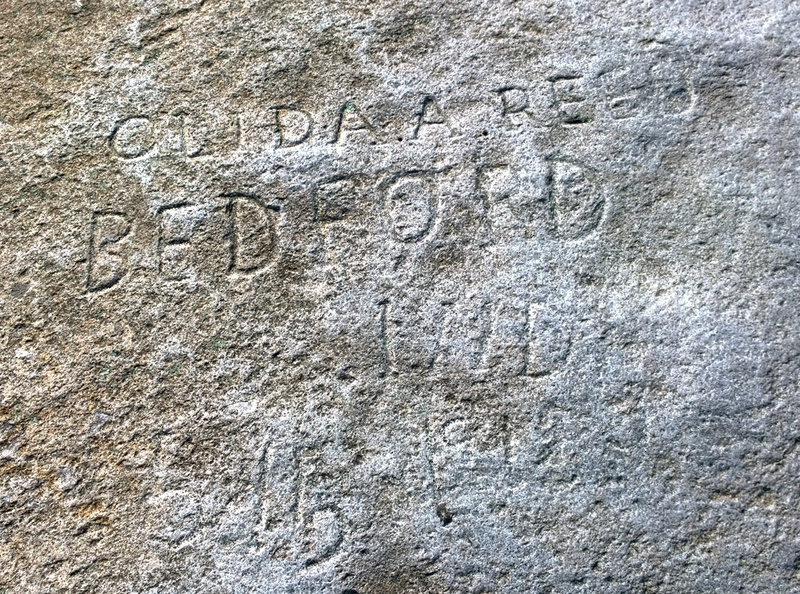 Much of the limestone used for monuments in Washington, DC came from Bedford. Along with his wife, his household includes two sons, two daughters, one daughter-in-law, and one granddaughter. He last appears on the census in 1940 with just his wife Myrtle. Find A Grave has a listing for him in Beech Grove Cemetery in Bedford. A social security claim lists his date of death as 30 July 1943. It’s not clear why two carpenters from Bedford, Indiana were at the top of Stone Mountain on the same day in 1912, but the proximity of their carvings on the mountain suggest some familiarity between them. In May of 1912, Isaac Hawkins would have been 37 and Clida A. Reed would have been 24. I searched online indices for the Atlanta Constitution to see if any sort of large construction project was underway, but couldn’t find any info. The mountain was still owned by the Venables at that point, though apparently, 1912 was the year when the idea first originated to put a carving on the mountain honoring Confederate soldiers, and the face of the mountain was deeded to the United Daughters of the Confederacy for that purpose, though work would not start on it for several years. Since Bedford is known for limestone quarries, perhaps Hawkins and Reed also had experience in stonework that brought them to Stone Mountain. The carvings show a reasonable degree of skill, suggesting that either they had proficiency in this area or they had assistance from someone in the granite works for the task. Whatever is was that brought them there, Clida Reed doesn’t appear to have stayed long, as he married in Indiana in December of 1912. Perhaps the death of his wife, Sylva required him to return home. There’s no indication how long Isaac Hawkins stayed, though if he and Reed were there together, they probably left together as well. In any event, they made the journey and like many before and since, they left their mark on the mountain. United States of America, Bureau of the Census. Tenth Census of the United States, 1880. (NARA microfilm publication T9, 1,454 rolls). Records of the Bureau of the Census, Record Group 29. National Archives, Washington, D.C.
Twelfth Census of the United States, 1900. Washington, D.C.: National Archives and Records Administration, 1900. T623, 1854 rolls. Thirteenth Census of the United States, 1910 (NARA microfilm publication T624, 1,178 rolls). Records of the Bureau of the Census, Record Group 29. National Archives, Washington, D.C.
Fourteenth Census of the United States, 1920. (NARA microfilm publication T625, 2076 rolls). Records of the Bureau of the Census, Record Group 29. National Archives, Washington, D.C.
Fifteenth Census of the United States, 1930. Washington, D.C.: National Archives and Records Administration, 1930. T626, 2,667 rolls. Sixteenth Census of the United States, 1940. Washington, D.C.: National Archives and Records Administration, 1940. T627, 4,643 rolls. “Indiana Marriages, 1811-2007,” database with images, FamilySearch (https://familysearch.org/ark:/61903/1:1:VKJ4-V8L : accessed 16 August 2015), Clida A Reed and Sylva Carpenter, ; citing , county clerk offices, Indiana; FHL microfilm 1,317,738. “Indiana Marriages, 1811-2007,” database with images, FamilySearch (https://familysearch.org/ark:/61903/1:1:VKJC-4HB : accessed 16 August 2015), Clida A Reed and Pearlie Elma Manus, 07 Dec 1912; citing , Lawrence, Indiana, county clerk offices, Indiana; FHL microfilm 1,317,735. “Indiana Marriages, 1780-1992,” , FamilySearch (https://familysearch.org/ark:/61903/1:1:XFXN-CYV : accessed 16 August 2015), Clida A. Reed and Florence E. Stinebuch, 04 Aug 1923; citing reference 491; FHL microfilm 2,108,463. Great research on these carvings. Very interesting to read! I have really enjoyed reading your blog here. Thank you for keeping the history of the area alive. Thanks, Deanna. It’s always great to hear from someone connected to the carvings.